This South American native is incredibly easy to grow and offers a spectacular display of color all season long. 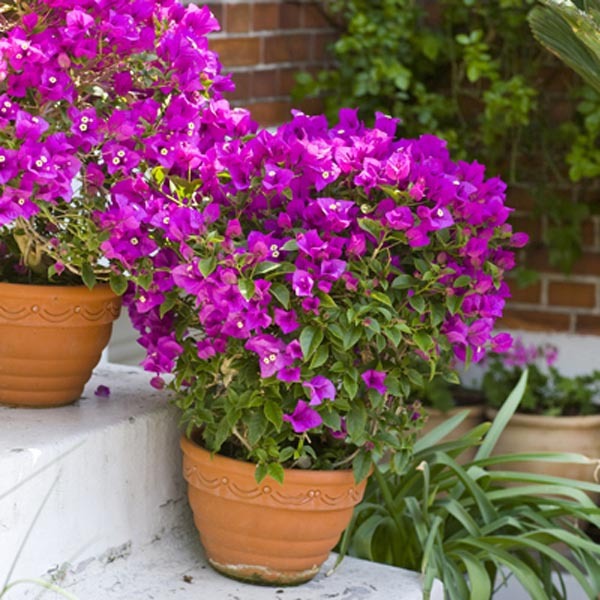 In addition to adding a lush, tropical feel to the landscape, this vine is drought tolerant, salt tolerant, and thrives in just about any well-drained soil. Prune to maintain desired size. In cold climates Bouganivillea can be grown indoors in a sunny location. Beautiful trained to fences, posts, latticework and trellises. Nice for larger patio containers. A reliable groundcover for any location. Best used for large scale plantings. A heat tolerant selection. Best in fertile, well-drained soil. Keep soil moist, watering freely in dry weather. Prune back early each spring for best display.